Was the Green Lantern your favourite DC superhero? If so, this may just prove to be your favourite of the three DC comic book slots released just now by NextGen Gaming. Along with Batman, it offers up some real excitement and innovative features to enjoy. 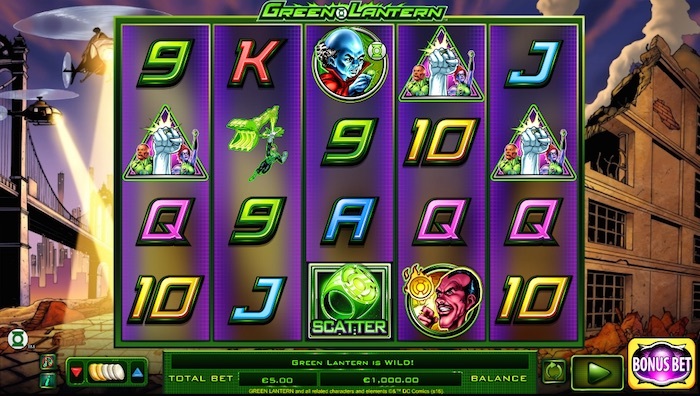 The Green Lantern online slot game is a 5×4 slot with 50 paylines in play. If you’ve tried the Batman and The Flash slots from NextGen Gaming already, you’ll notice the game controls are identical and the way the game plays is consistent and of high quality as well. This NextGen slot does have a brighter, neon-inspired colour scheme going on, but that’s no bad thing. While there are K, Q and A-style symbols, coloured to suit the theme, it’s the other symbols related to the Green Lantern story that will really catch your attention. A dramatic cityscape in partial ruin greets you when you first load the Green Lantern online slot. However, if you choose to activate the Bonus Bet feature, you’ll see this change to a dramatic outer space backdrop. The graphics in each case are impressive, with the reels and symbols exuding an almost-neon glow. The game controls are easy to operate and are the same throughout all three NextGen Gaming DC superhero slots as well. The Bonus Bet option is at the bottom right, while the coin values can be toggled on the bottom left. Each winning line is clearly indicated when you get a win. Look for the tiny ‘i’ tucked away at the bottom-left corner and you’ll access the pay table. This immediately reveals some of the special symbols you can look forward to, such as the Green Lantern himself as the wild. He doubles all prizes he helps you win in the main game, and adds a 4x multiplier in any free games. There are two lanterns, which we will come to in a moment. Alongside these, you can expect to see some enemies of the Green Lantern and a couple of other symbols related to our hero. The remainder of the symbol pay lesser amounts for three or more, and are of the usual K, Q, A nature. There is a standard lantern and a green lantern, and 24 free games can be triggered when you get green lanterns on the second and fourth reels, with a standard lantern on the third one. During these spins, the green lantern offers up a 4x multiplier. 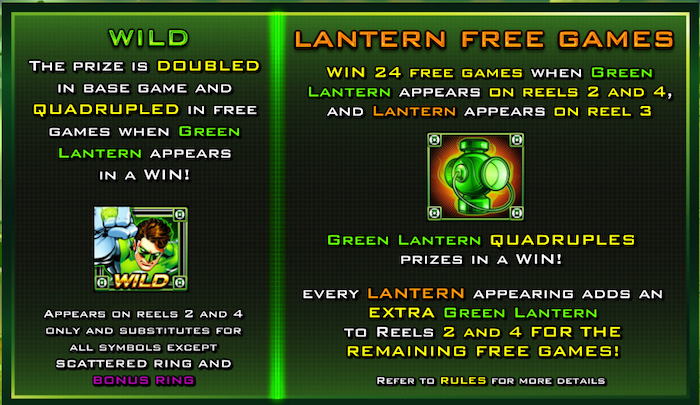 If you find a standard lantern during the free spins, you’ll automatically receive another green lantern on reels two and four that will remain in play for the remainder of the free games. This happens for every plain lantern you get. Now let’s move on to the scatter. This is a green ring, but it is only a scatter if you don’t use the Bonus Bet feature. If you do, it transforms into a bonus ring instead. Get two for a credit prize, while three or more grants you entry into the Bonus Ring feature as well as a credit prize. A quick word on the Bonus Bet – you can activate it from the bottom-right corner of the game screen at any time before placing a bet. It automatically requires an additional 10-coin bet on top of whatever you would normally bet. The Ring feature sees the Green Lantern in a fight against his nemesis, Sinestro. Obviously the idea is to win. The better you do, the bigger the prize. This will be between 2x and 100x the bet that triggered this round. The game offers a 50p minimum bet if you decide not to use the Bonus Bet feature, and a max bet in this case of £100. Activate the additional feature and the minimum bet becomes 60p, while the maximum goes up to £120. The 92.35% RTP isn’t bad in normal play, but you get a much healthier RTP of 95.34% if you do decide to play with Bonus Bet in place. You have to decide whether those additional 10 coins per spin are worth it for the bigger potential return. The best DC superhero online slots are here, and whichever of the three is your favourite, there’s a good chance you will enjoy them all. NextGen Gaming’s Green Lantern slot is definitely a winner, and with the chance to use the autoplay feature as well, it caters for all requirements. As with all the DC Comics slot games released just now, the Green Lantern also displays and plays well on tablets, smart phones and old-fashioned desktop computers as well. 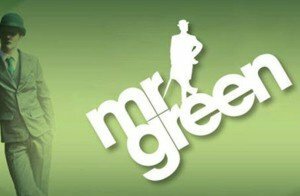 All in all, it offers an enjoyable experience, with free spins and the promise of an extra bonus for bigger-bet players. What more could you ask for from a brand-new slot?